I recently attended a session at a conference by Andrew Hieronymi, (bio) whose recent work focuses on the boundaries between games and art in physical environments. He is currently a professor of Interactive Design and Game Development at the Savannah College of Art and Design in Savannah, Georgia. The particular project he presented was called MOVE. This project consists of a list of verbs that each embody a central game mechanic to make a series of installation art pieces. 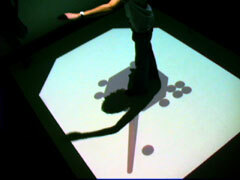 Each game is displayed as an installation using computer vision and full body interaction, allowing participants to experience six different types of actions usually performed by avatars in video games. These actions include avoid, chase, jump, throw, hide and collect. The simplicity of the games have allowed them to be accessible to a variety of different audiences around the world where he has displayed his work. It also provides an opportunity to reflect on the kinds of interactions that are available and possible not only for interactive art but also for games. His focus on actually putting a person into the physical space of the game is an interesting approach and one that has long been valued by game designers in their physical prototyping phase. It is also becoming a more and more popular form of gaming as ‘exergaming’ or projects such as the Swarm that Saeed Zare shared recently in an EdLab seminar, continue to add more and more real world actions on the players part into games. Andrew is also interested in coming to NYC to do an installation, so I will keep you posted if he comes, so you can check out the installations for yourself. In the mean time, you can check out the videos of people playing the games on his website- just click on the linked actions below. Also check out his website for other projects he is working on and if interested have a look at this paper. Playtime in the White Cube- Game Art: Between Interactive Art and Video Games.